HOW TO ORDER: Proceed though checkout and print a copy of your receipt and send your EMPTY Neopost IN360 / IN-360 cartridge to: Mailcoms Ltd, 3 & 4 Heritage Park, Hayes Way, Cannock, WS11 7LT. 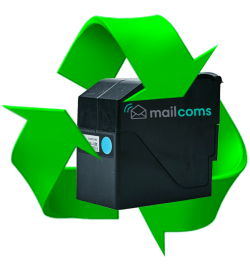 Mailcoms were the first company in the UK to offer a Neopost refill and reset service. This was made available for Neopost franking machine ink cartridges nearly 10 years ago. Since then our Mailmark blue ink has been tested and approved by the Royal Mail to include perfect Mailmark barcode reading. This is a IN360 & IN-360 ink refill and IN360 & IN-360 ink reset service. It is ideal for your Neopost IN360 and IN-360 Mailmark ink cartridge. We will refill your original Neopost IN360 / IN-360 Mailmark ink cartridge with Royal Mail approved Mailmark blue franking ink and replace or reset the chip back to factory settings. We guarantee this Neopost IN360 & IN-360 refilling service will give the same quality prints from when it was new and last the same amount of prints of an original IN360 / IN-360 ink cartridge. Mailcoms will guarantee this Neopost IN360 & IN-360 Mailmark ink cartridge will offer a similar quality, life and amount of prints as the original manufacturers ink cartridge. Please note our compatible Neopost ink cartridges are not manufactured by Neopost. Furthermore if you require any further assistance, help and not to mention support for this ink cartridge please contact us immediately.